CHIP, combined with Medicaid, provide a crucial safety net of coverage for low-income children. Both programs, aided by maintenance of eligibility (MOE) provisions maintained under the Affordable Care Act (ACA) helped to stave off increases in the number of uninsured children. Between 2007 and 2012, the uninsured rate for children dropped from 10.9% to 9.2%, despite a decline in the share of children with employer-sponsored coverage.1 CHIP offers coverage to low-income children in families without access to affordable coverage but with incomes above Medicaid levels. 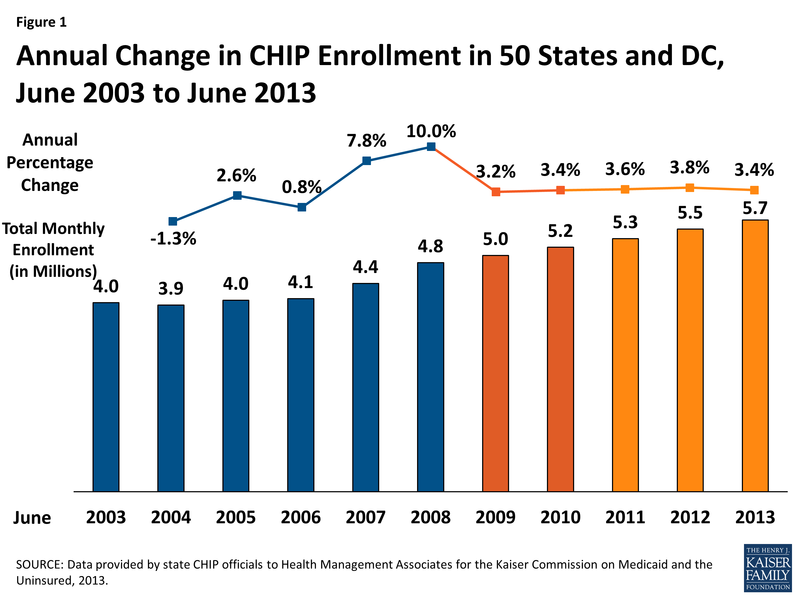 Economic conditions provide upward and downward pressure on CHIP enrollment. During the economic downturn, many Americans lost jobs and incomes declined, making children in such families eligible for CHIP. However, as family incomes continued to fall, children moved from CHIP to Medicaid. In addition to the MOE provisions mentioned above, which require states to maintain eligibility levels until 2019 for children, CHIP programs also face the same ACA requirements in terms of enrollment simplifications, coordination with Medicaid and the new Marketplaces, as well as the use of Modified Adjust Gross Income beginning in 2014. The ACA requires that Medicaid cover children with incomes up to 133 percent of the federal poverty level (FPL) as of January 2014. Before this change, states were required to cover children under the age of six in families with income of at least 133 percent FPL and school-age children and teens with incomes up to 100 percent FPL in Medicaid. Many states already covered children with incomes up to 133 percent FPL in Medicaid, but due to the change in law, 21 states needed to transition some children from their CHIP state plans to their Medicaid state plans. A few of these 21 states decided to move these children before the requirement was in place. New York and Colorado implemented an early transition of children from CHIP to Medicaid but are maintaining separate CHIP programs. Meanwhile, New Hampshire and California moved or are in the process of transitioning all CHIP kids to Medicaid, not just these older children with incomes under 133 percent FPL. The remaining 17 states will transition an estimated 13 percent to 48 percent of their CHIP coverage to Medicaid.3 These children remain eligible for the Title XXI Federal CHIP match rate. This CHIP enrollment report series has always included Title XXI-funded enrollees only (children enrolled in both Medicaid expansion CHIP programs and stand-alone CHIP programs) while its companion Medicaid enrollment report has included Title XIX-funded enrollees only; this has ensured an unduplicated count between Medicaid and CHIP children. Because of difficulties in identifying which of these children are in fact being transitioned and to continue to ensure unduplicated counts with the companion report for Medicaid, these older children are still included as CHIP enrollees in this report. Therefore, the early transitions described above are accounted for within CHIP in this report. California’s CHIP enrollment represents over one-fifth of all CHIP enrollment across the country; enrollment growth in this program therefore has a significant effect on total CHIP enrollment. CHIP enrollment increased in California by 8.8 percent as 101,163 additional children were enrolled in June 2013 compared to one year earlier. The transition of children previously enrolled in the Title XXI Healthy Families to Medi-Cal (Medicaid) would not affect CHIP enrollment numbers reflected in this report because these children are still included in the CHIP counts. The increase in the number of children enrolled in CHIP may be related to outreach and enrollment efforts tied to expanded Medicaid and CHIP coverage programs in California, and also to the improving economy with children moving up the income scale between Medicaid and CHIP. 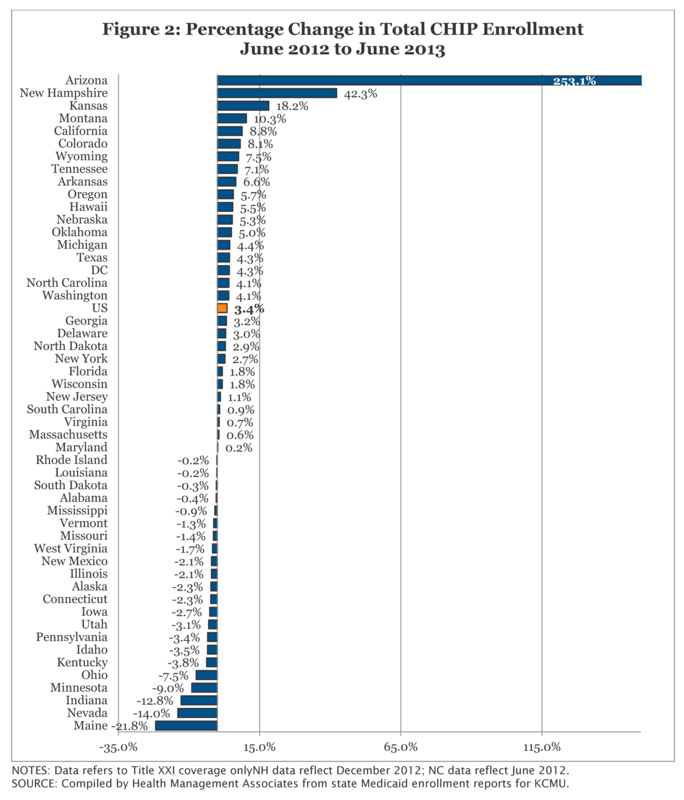 In terms of percentage change from one year to the next, enrollment in 2013 grew at a slower pace than in the prior annual period in 32 states. The only four states that experienced double digit growth were Arizona, Kansas, Montana, and New Hampshire. CONCLUSION. Overall, CHIP enrollment continued to increase, but growth slow to the lowest rates since the start of the Recession as the economic conditions continued to improve. CHIP programs, along with state Medicaid programs continue to play a critical role in assuring health coverage for uninsured children. This Data Snapshot was prepared by Vernon K. Smith of Health Management Associates along with Laura Snyder and Robin Rudowitz of the Kaiser Family Foundation.